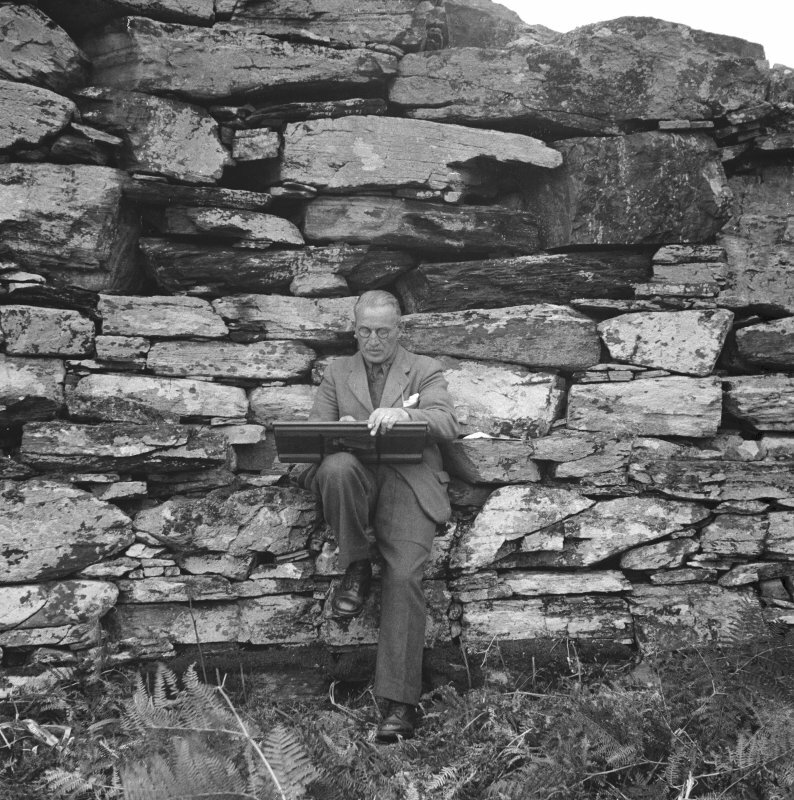 View of interior of Dun an Ruigh Ruadh, showing Charles S T Calder surveying, drawing board on knee. 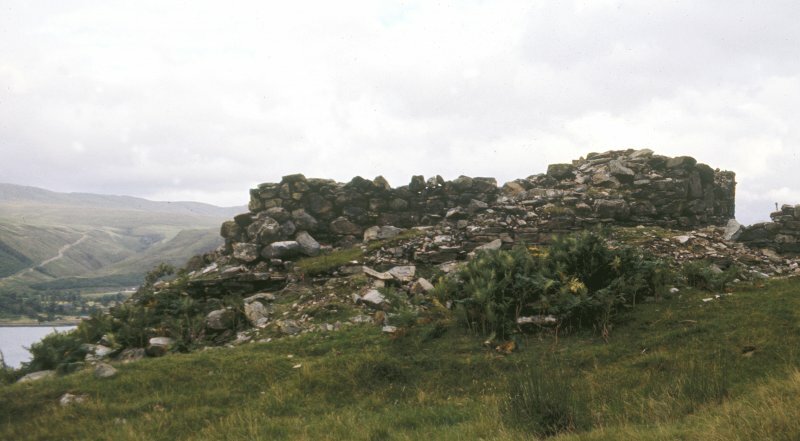 Photograph showing outer face of broch. Dun an Ruigh Ruadh: The remains of a galleried dun according to MacKie, but a broch according to the other authorities, of which roughly a third of the NE arc has fallen over the rocky bluff on which it stands, but the remainder still stands to a maximum height of 9'6" over accumulated debris of about 4'. It measures c. 38' in diameter internally with walls c. 14' thick. Excavations by MacKie in 1968 revealed a flattened circle on plan, the straighter side of which runs along the edge of the bluff. Here, the wall is thinner and less well built, lacking the intra-mural gallery visible elsewhere. The stairway to the first-floor level and part of the stair to an even higher level are discernible. The doorway in the E is checked. A scarcement is visible 4 1/2' - 5' above ground level. Within the central court are post-holes indicating a raised wooden structure resting on the scarce- ment and posts, which was later pulled down, and the dun used as an ordinary dwelling. The post-holes were filled in, cobbles laid on top of them, and a stone tank was sunk into the interior. Finds include several rotary querns, a stone pot lid, a jet counter, hammer stones, and a silver finger ring. 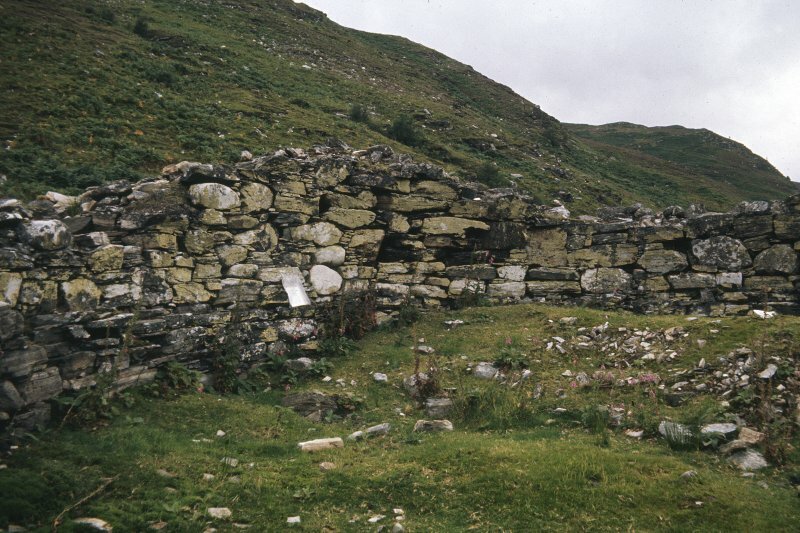 Dun an Ruigh Ruadh, a galleried dun as described by MacKie. (NH 1494 9009) The site is an IA stone fortlet, of the semibroch type and probably a prototype broch; it is only the second of its class to be excavated. Radiocarbon dates show that it was built in th 3rd or 2nd centuries b.c. and this early date is supported also by artefacts. The mainly aceramic material culture shows strong links with S Scotland but the fort itself is Hebridean, as are the three early potsherds found. The wall has an upper and lower intra-mural gallery and seems originally to have contained a roofed round-house with an oval of wooden posts and a central hearth. Later the wall was partly demolished and the IA occupation continued for a while. After a period of abandonment there was some Medieval use of the wall gallery and sheep dippers worked in the ruined fort in recent times. 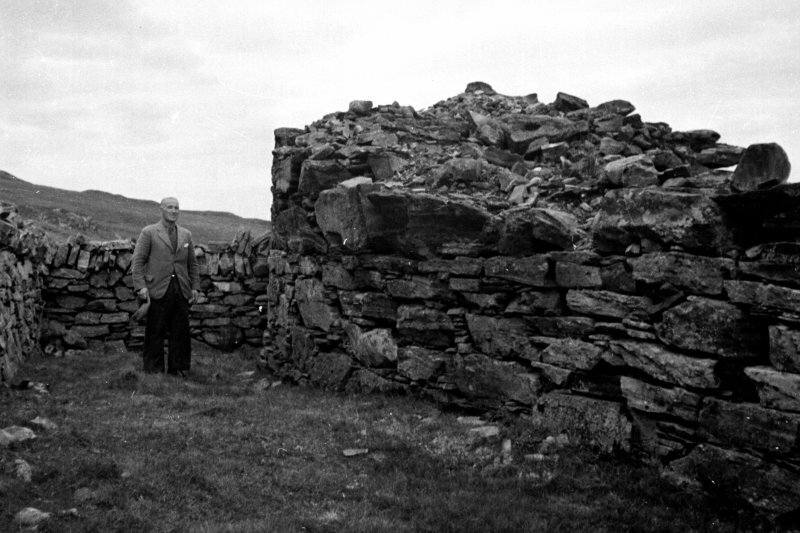 Following the report of an unrecorded vitrified fort at Dun Lagaidh, Ullapool, in October 1947 Kenneth Steer and Charles Calder, RCAHMS, surveyed the site, together with a number of monuments in the vicinity. The broch stands on an open hillside on the edge of a small precipice. On the uphill side it is still some 3.50m high; on the lower side it has collapsed to its foundations. The approach is from the south, where the rectangular walls of a modern sheep pen and dip are built against the broch. Here the fallen stone has been cleared from the broch walls, though piles of rubble remain elsewhere (the large stone piles beside the sheep dip are excavation dumps). The entrance, now infilled, was through the low part of the wall on the southeast. The inside of the broch has been cleared of stone, but most of the features in the wall have been blocked up to preserve them. A scarcement ledge can be seen in the highest part of the wall. It is only 1.20m above ground level on the uphill side, though as the floor sloped down it would have been some 2.50m above the floor on the other side. Inside the broch, some 4m left of the entrance is a blocked doorway leading to a chamber in the wall on the left, and a stairway going up on the right (the low ' lintel' to this door is only part of the modern blocking). From a landing on the stair a door led out onto a wooden floor above the central court, supported on the scarcement ledge. Beyond this is the stairs went up again. In the highest part of the wall are the remains of a narrow gallery with a few lintel slabs still in position. Excavation inside the broch showed there had been a central hearth and a ring of posts to support the upper floor. A flat rotary quern was found in one posthole (this, and the few other finds are in the Hunterian Museum, University of Glasgow). Two other postholes by the entrance may have held in inner door. Various phases of reuse after the broch had been partly dismantled were identified. The excavator has suggested that this broch did not have a hollow wall all round, but had a straight stretch of much thinner, solid wall above the precipice and should therefore be called a 'semibroch'. Since this part of the wall is missing one cannot be too sure of its structure, but there would have been room to build a wide wall all round if about 1.50m of cliff has fallen away since the iron age. Information from ‘Exploring Scotland’s Heritage: The Highlands’, (1995). 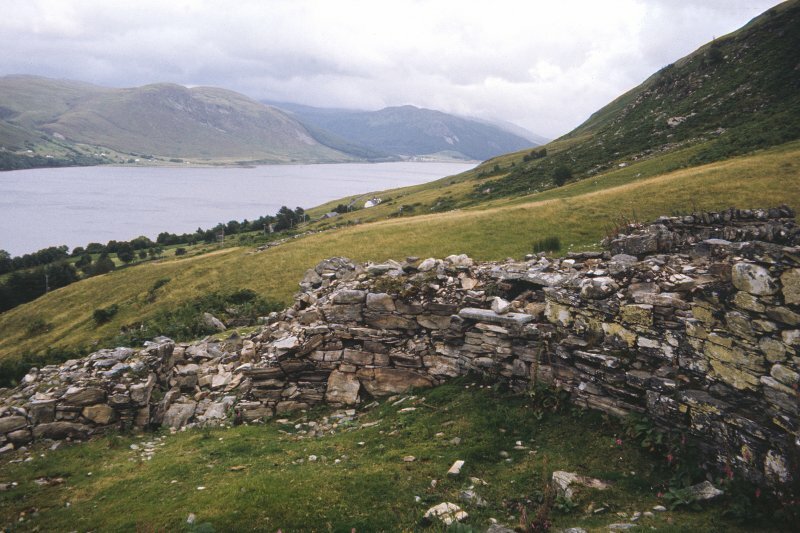 NH 149 900 A survey of the broch of Dun an Ruigh Ruidh overlooking Loch Broom, near Ullapool was carried out, 9–11 June 2015. The survey was undertaken using a Trimble FX laser scanner, and a detailed descriptive report and photographic record compiled. 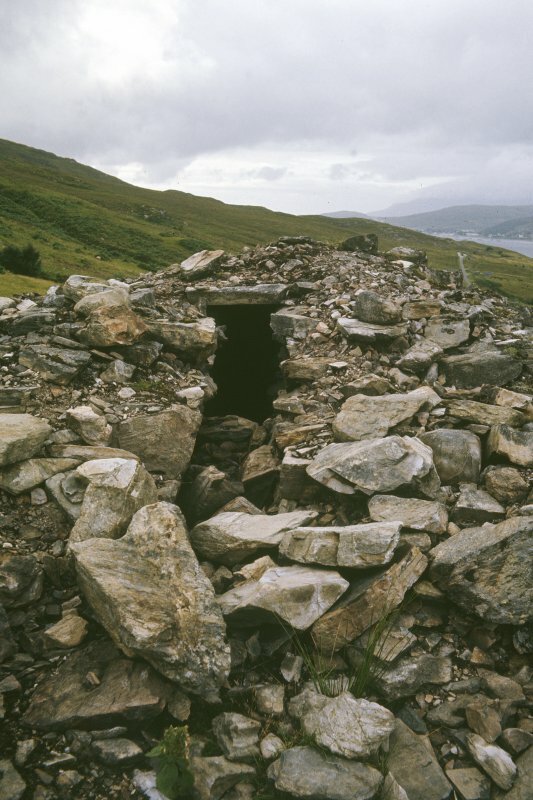 Dun an Ruigh Ruaidh is situated on a steep NE-facing slope, immediately above a rocky cliff above Loch Broom, over which part of the structure has collapsed. The broch commands extensive views over Loch Broom and the narrow strip of arable land lying between the foot of the cliff and Loch Broom. The site is C-shaped in plan with the NE parts of the site having collapsed over the cliff. The broch measures 19.6m NW/SE by 14.4m NE/SW, externally and 10.9m by 10.5m internally. The walls of the broch vary between 3.7m and 5.0m in thickness and vary between 0.5m and 2.4m high. Dun an Ruigh Ruaidh lies at 87.7m OD with the cliffs below dropping to 76.4m OD. 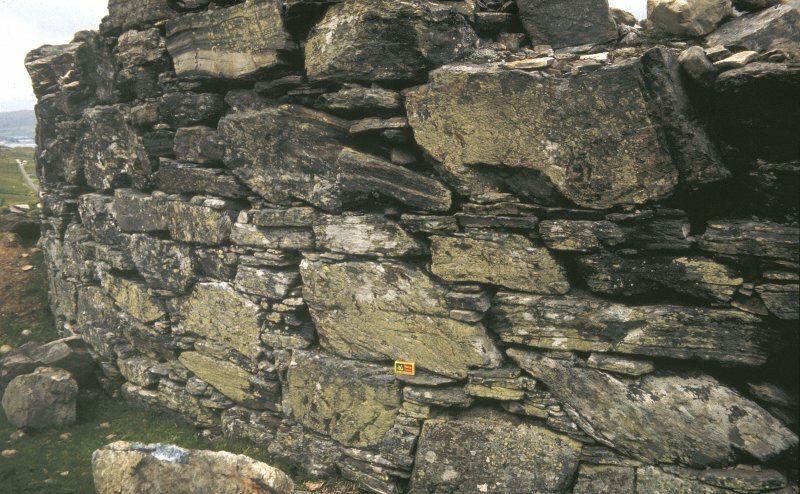 The walls of the broch are constructed of dry-stone, built of large stones of mainly Moine schist with small pinning stones filling the gaps and levelling the courses. In many places these pinning stones have fallen out. A sheep fold and dip have been constructed against the SW wall of the site, probably from collapsed stonework and rubble cleared from against the walls. A field boundary bank extends along the top of the cliff to the NW and SE of the broch. The entrance of the broch is hard to discern but lies on the SE of the wall circuit and is now filled with rubble and grassed over. The inner end of the entrance passage way is blocked with a dry-stone wall face, forming a continuation of the inner broch wall face. The entrance passage way is 1.9m wide and 4.8m in length. MacKie’s excavations revealed two door-checks formed of upright stone slabs, about 1m from the external wall. Immediately internal to the SW door check lay a posthole that may have been the pivot for the door. In the S, in the interior of the broch, is a now rubble-filled entrance passageway 1.6m in length and 0.9m in width with 0.5m of the height of the infilled entrance being visible above the rubble in the interior of the broch. A displaced lintel lies across the top of the rubble-filled entrance. The entrance passage leads to an intramural gallery that curves to the E towards the broch entrance and to the W, where the gallery rises to an upper level gallery, no stairs are now visible however. To the E of the entrance passageway the ground level gallery is 0.7m wide and extends for 3.0m. A lintel slab 1.4m by 0.4m survives at the junction between the entrance passageway and the ground floor gallery. As the gallery extends W and N from the entrance passage it must rise to a second entrance passage that enters the gallery from the SSW of the broch. This passage way extends for 1.6m, is 0.8m wide and survives 0.2m high. The interior wall face of the broch features a prominent scarcement ledge, which averages c0.35 to 0.4m in width and is somewhat less than level, there being c0.5m difference between its highest point on the SE side and the lowest on the NW side.